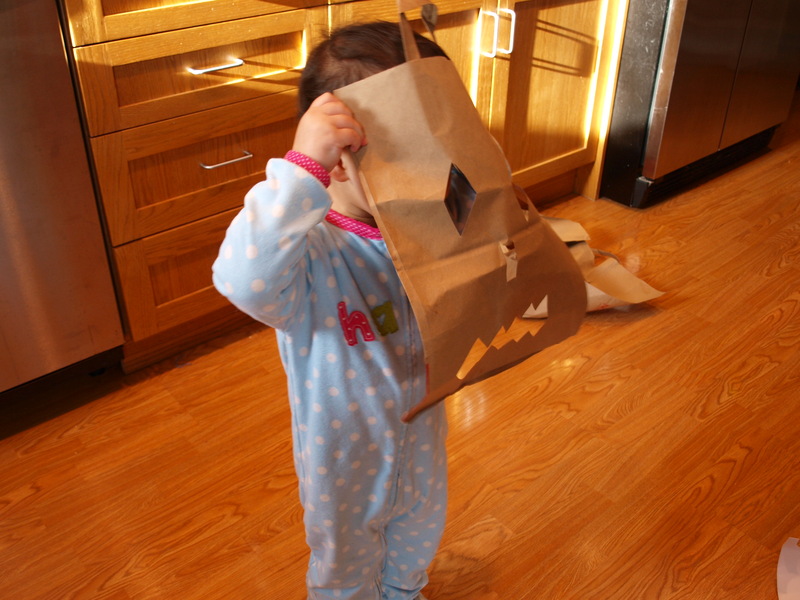 As y’all know, I love making crafts or projects using the bazillion brown paper grocery bags we have stockpiled in our kitchen drawer from over the years (like this One Minute Paper Bag Monster) or other recyclables lying around our house that would otherwise turn to waste (like this Repurposed Easter Grass Garden, these Rock Candy Maracas or our paper roll projects like these telescopes, binoculars and finger puppets). 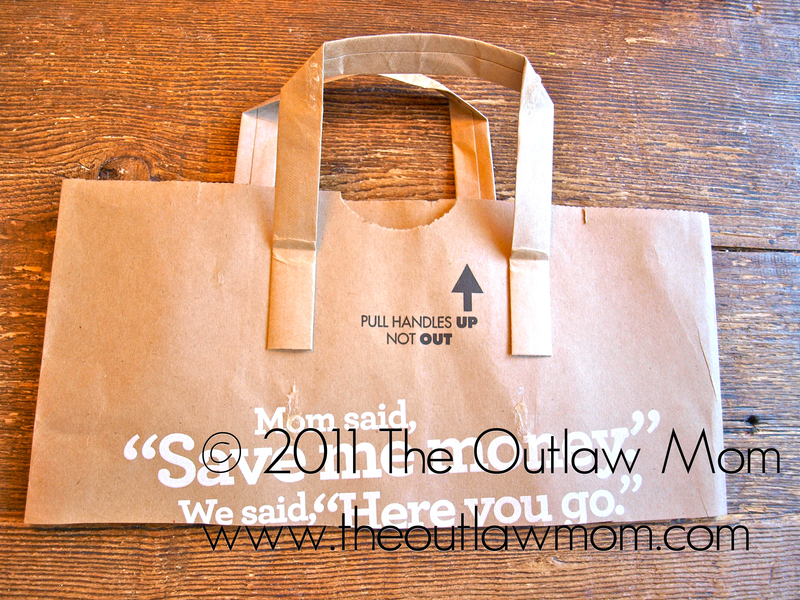 Cut off the top third of the grocery bag, which will form the top or “bust” portion of the dress. 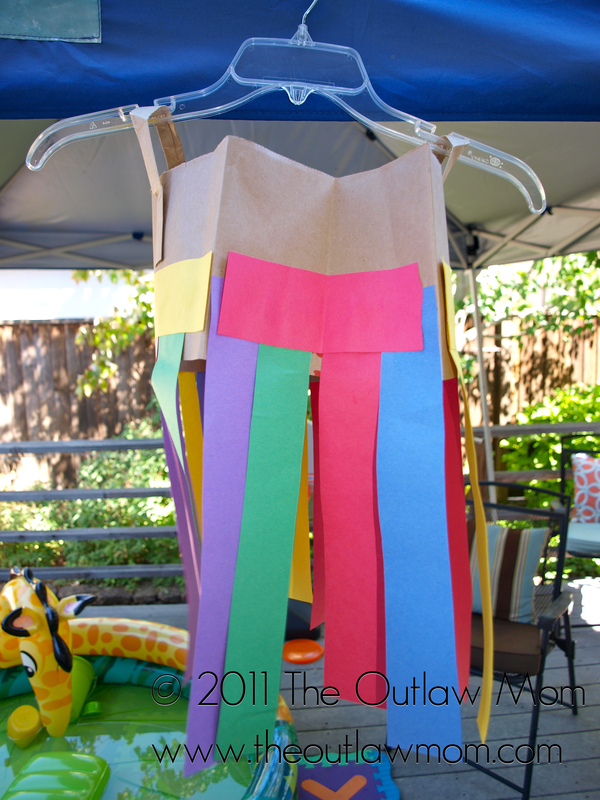 Snip lengthwise strips of the construction paper in whatever colors suit your fancy. Tape the strips hanging vertically from the bust. 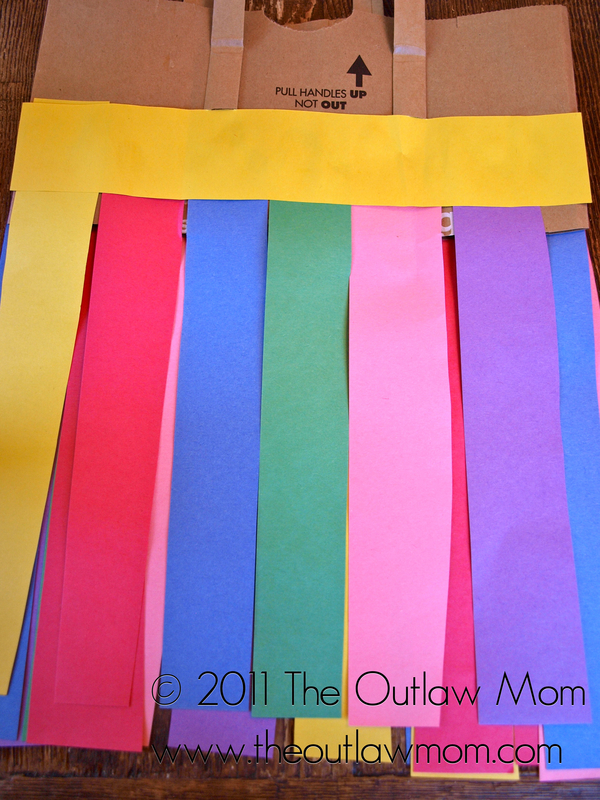 Cut an additional strip as a border for the top of dress and tape it down horizontally. 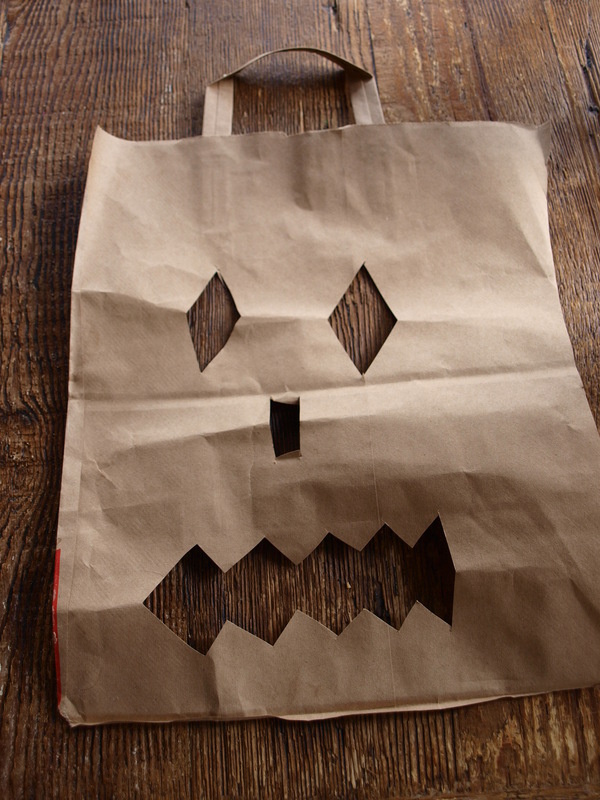 Do the same for the remaining three sides of the bag. 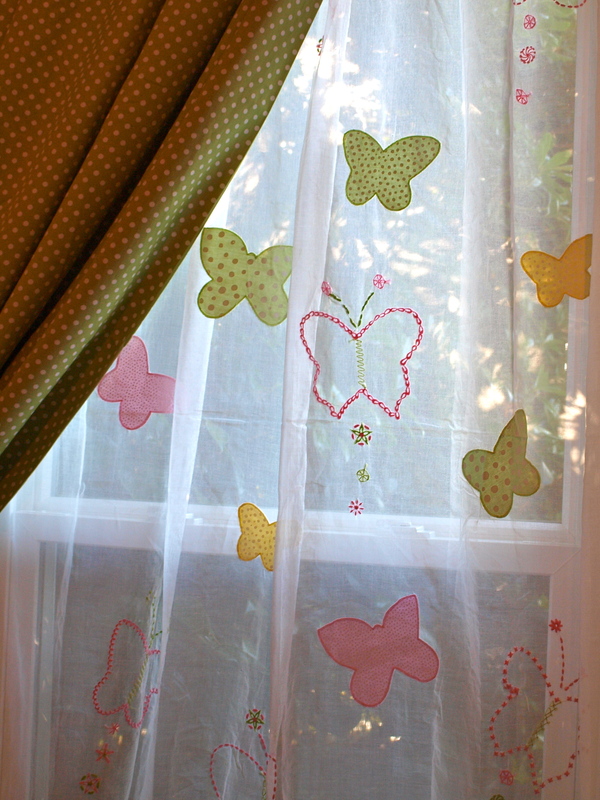 Embellish with cutout shapes or glue on gems and glitter. 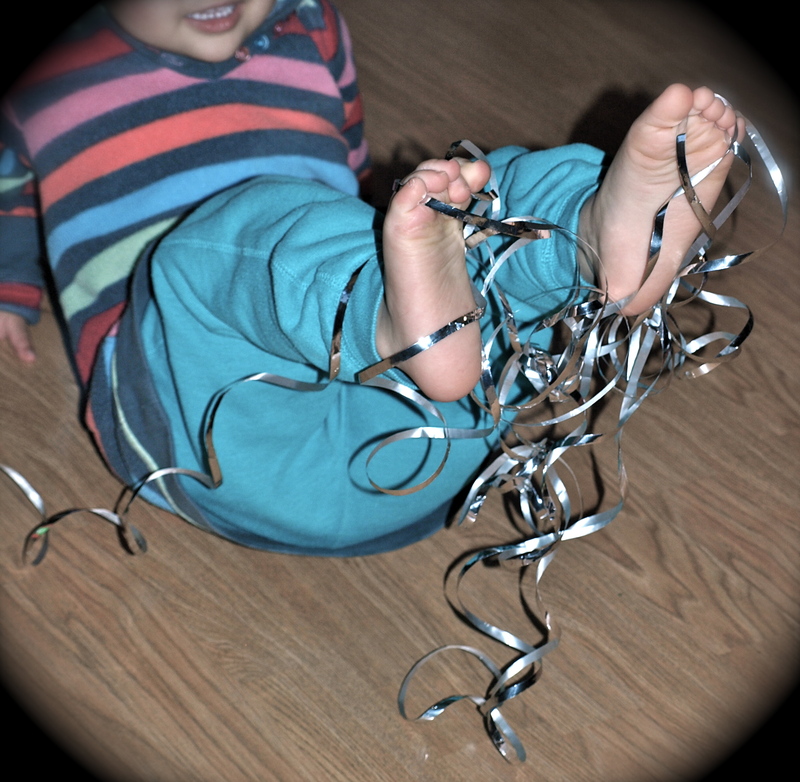 Now twirl! LEARN! 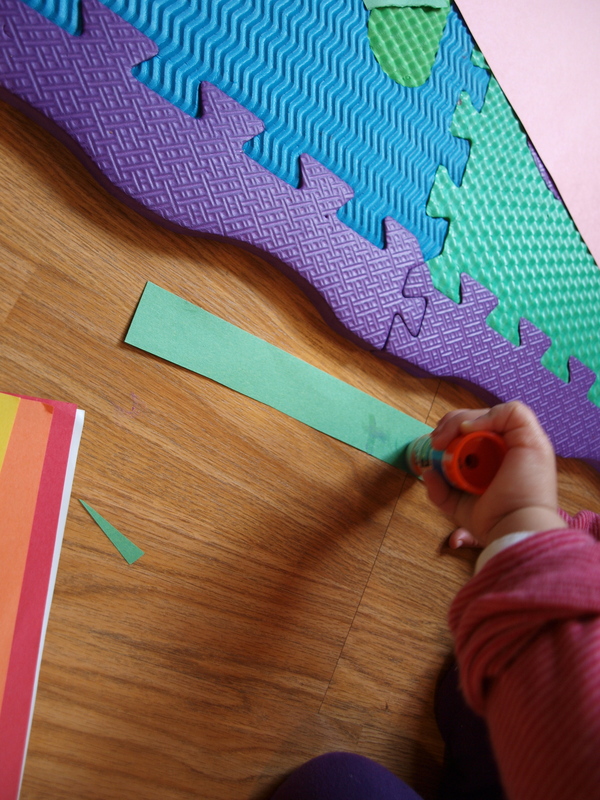 Colors, scissor cutting, pretend play. I guess we’ve been on a “roll” lately. 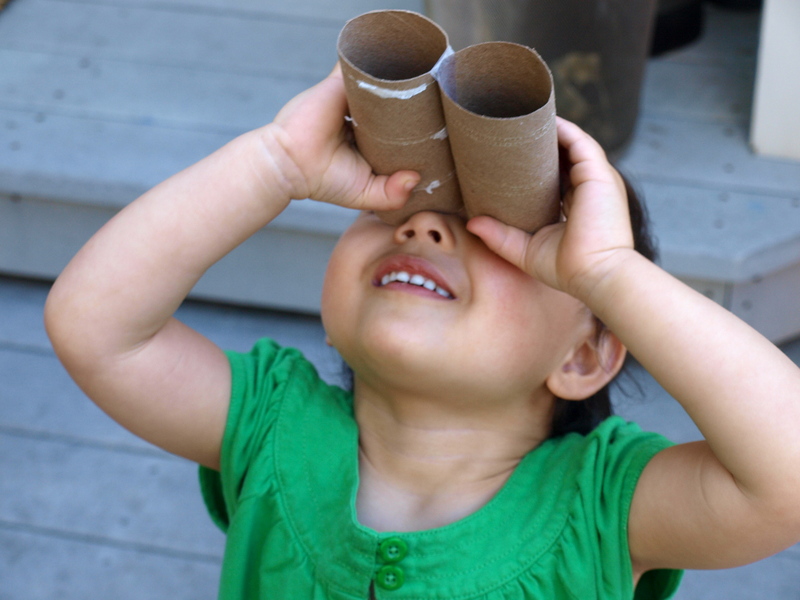 Last week was telescopes, this week it’s butterfly finger puppets (and room decor) and binoculars. 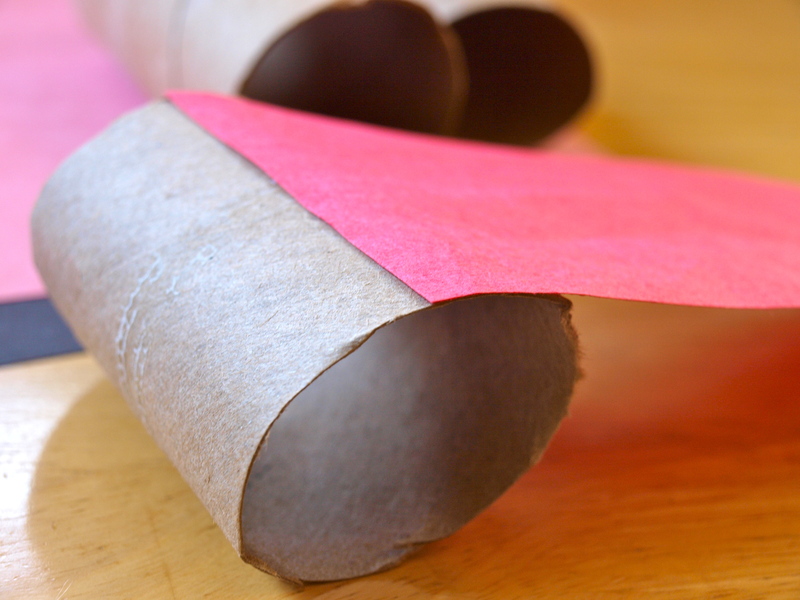 Cut a piece of construction paper to fit around the paper roll tube and tape or glue the paper to the roll. 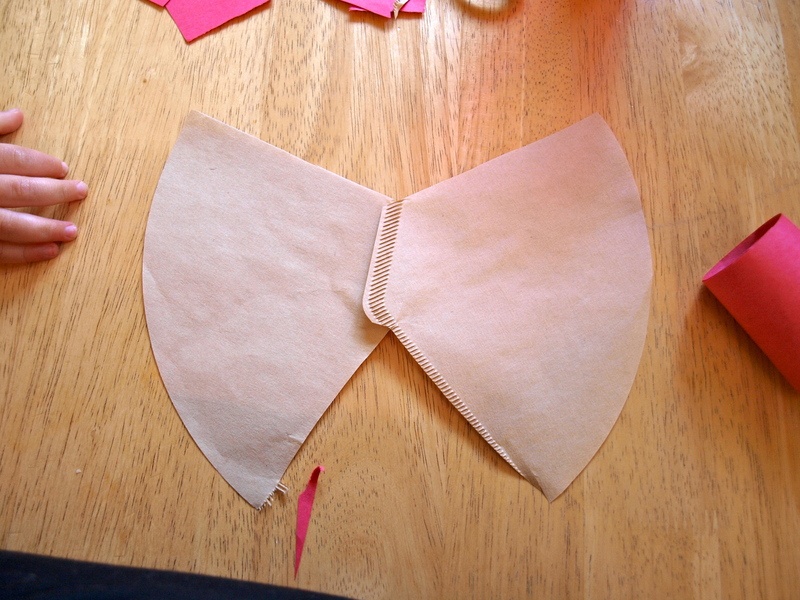 Cut along the two seams of the coffee filter and spread it out on your work surface to create butterfly “wings,” or cut out construction paper wings. 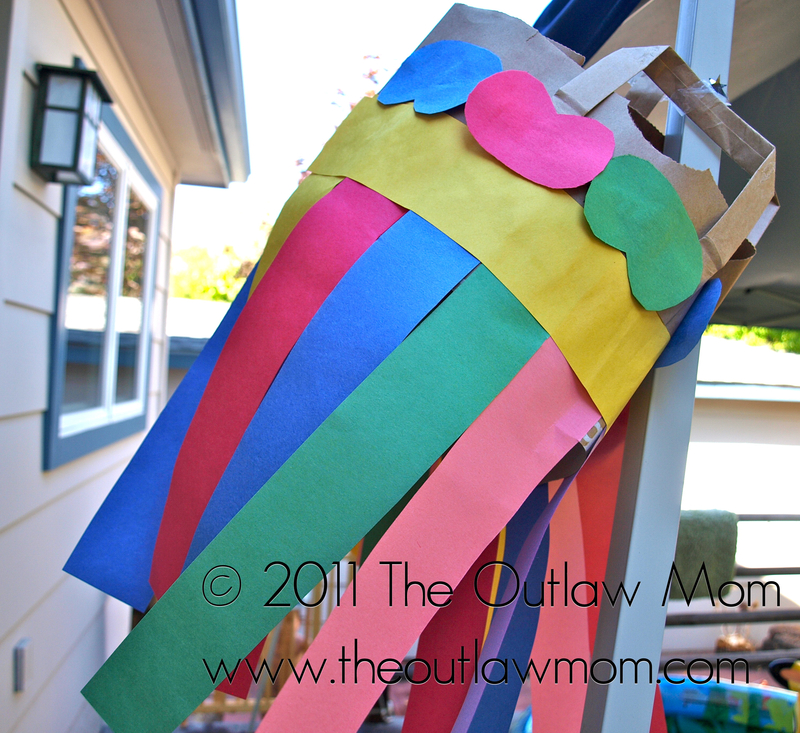 Decorate the “wings” with crayons, markers, stickers or paint. 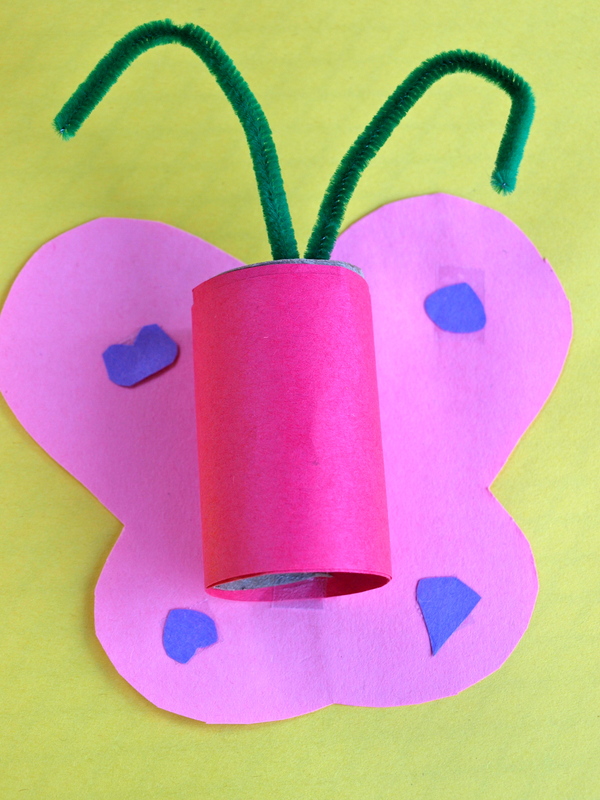 Then, lay the butterfly’s “body” in the middle of the wings and tape or glue down. 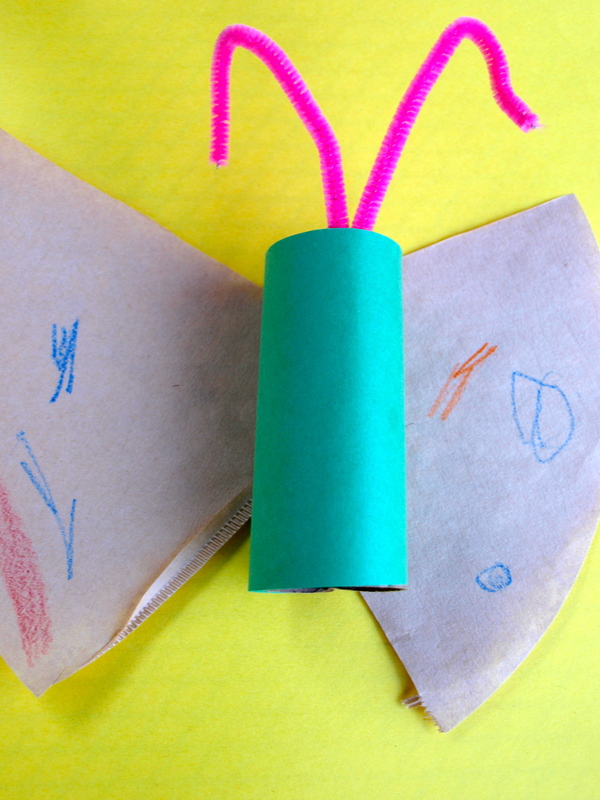 Add butterfly “antennae” by folding a pipe cleaner in half and curling the ends. 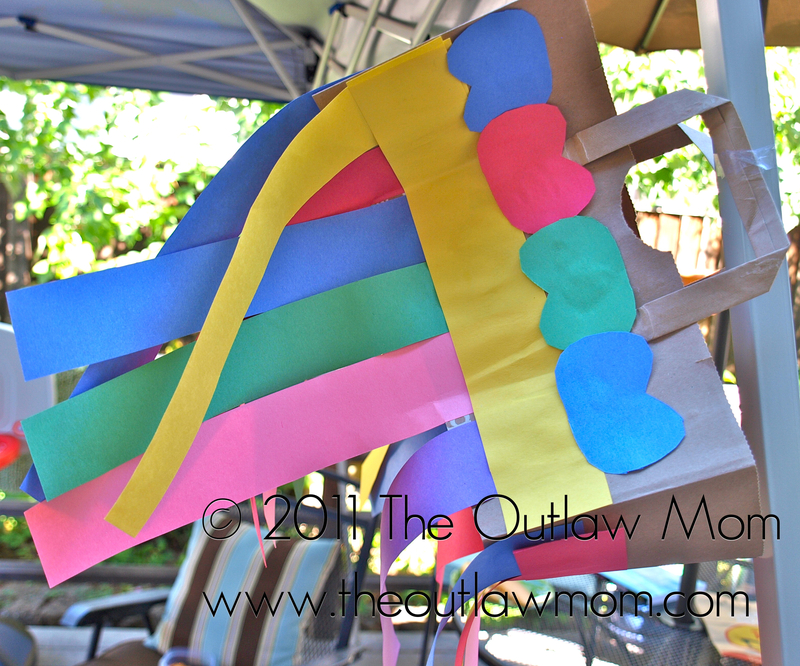 You can tape or glue the antennae down if necessary. Now, put them over your fingers and flap away! 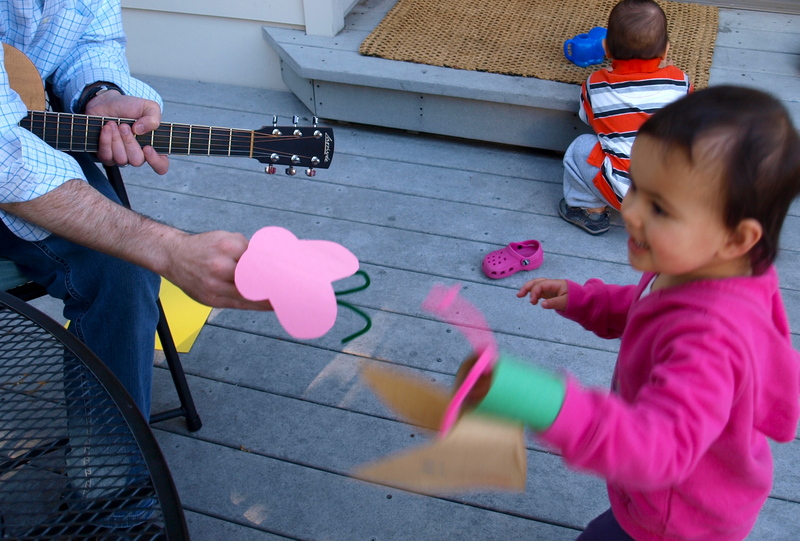 Even Hubby enjoyed playing with the butterfly puppets! 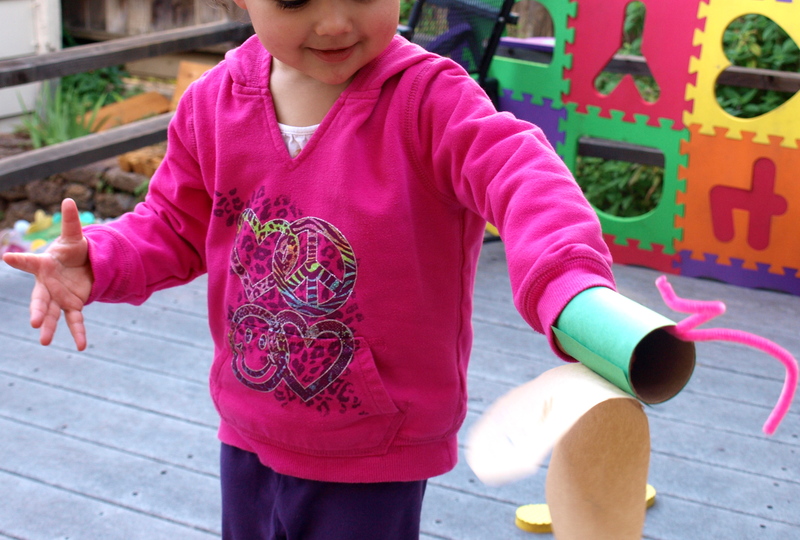 *Tip #1: if you have a small toddler, place all her fingers into the tube and it will be easier for her to manipulate. 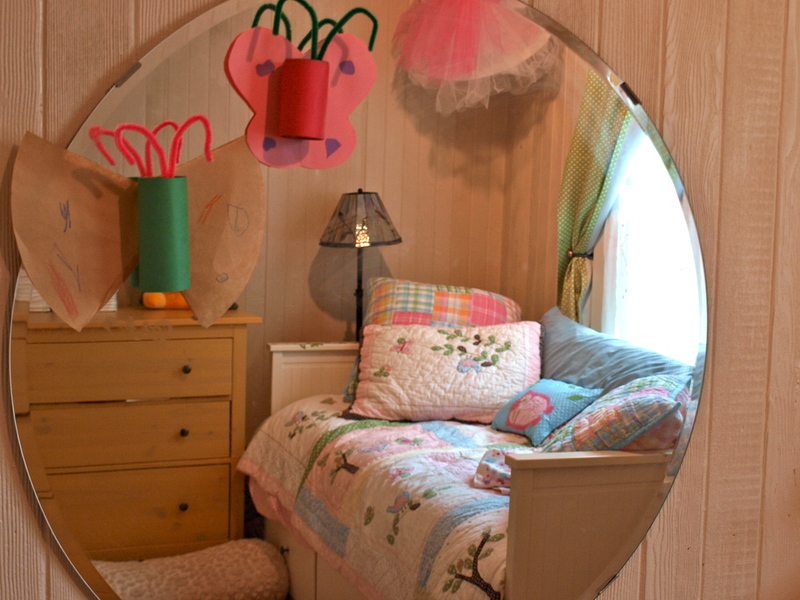 *Tip #2: When your toddler tires of her puppets, you can always use them as a fun new room decoration! 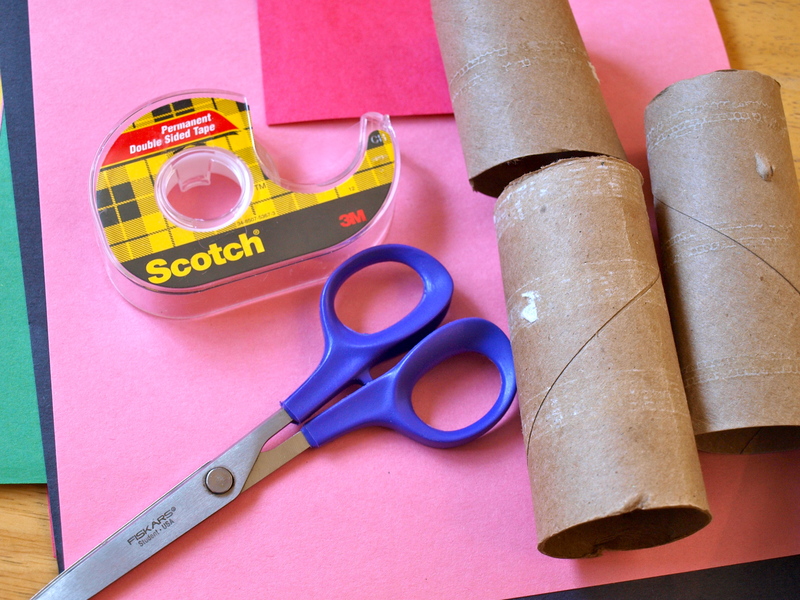 Use tape to stick two paper roll tubes together. 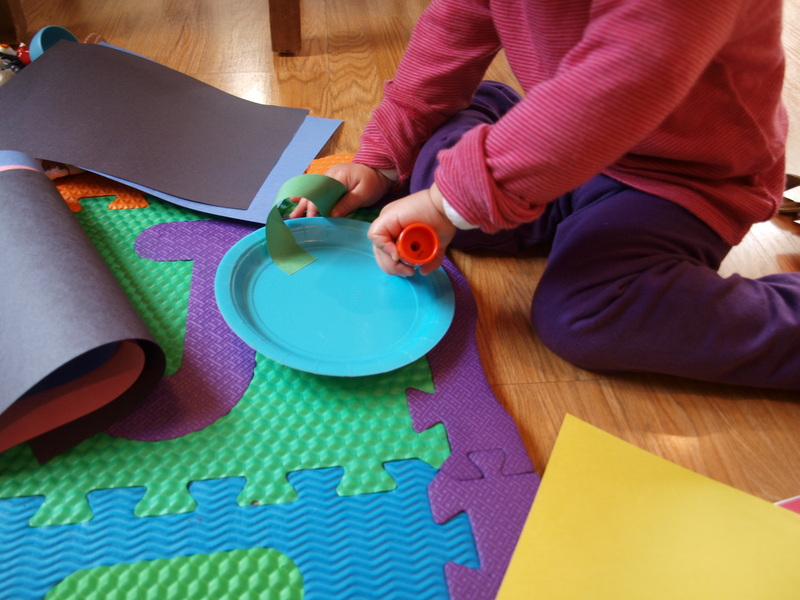 Tell me that wasn’t the easiest toddler activity ever! 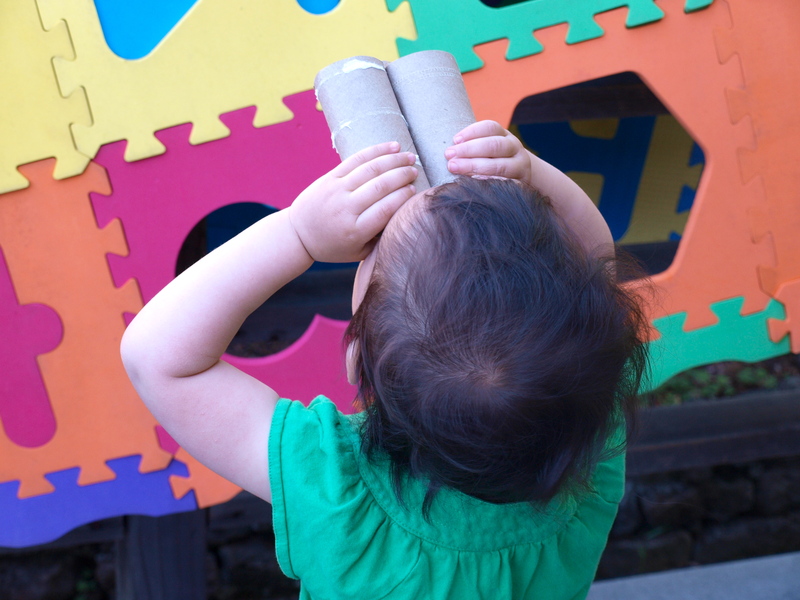 Jane loves sticks and stones. 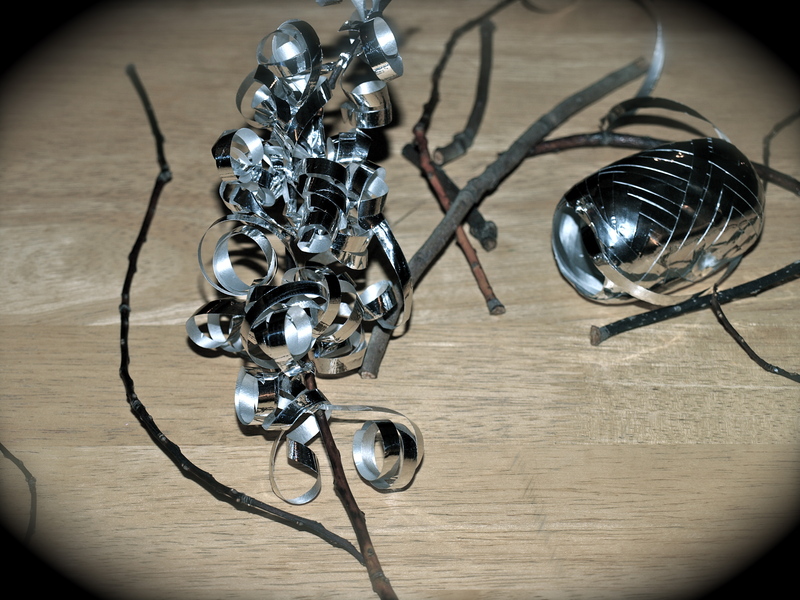 When we took a pre-bedtime walk last night to meet Hubby at the train, she picked up a nice little collection of branches as usual. Unfortunately, Hubby was delayed for two hours due to another poor soul’s unfortunate experience and we weren’t able to pick him up from the station. 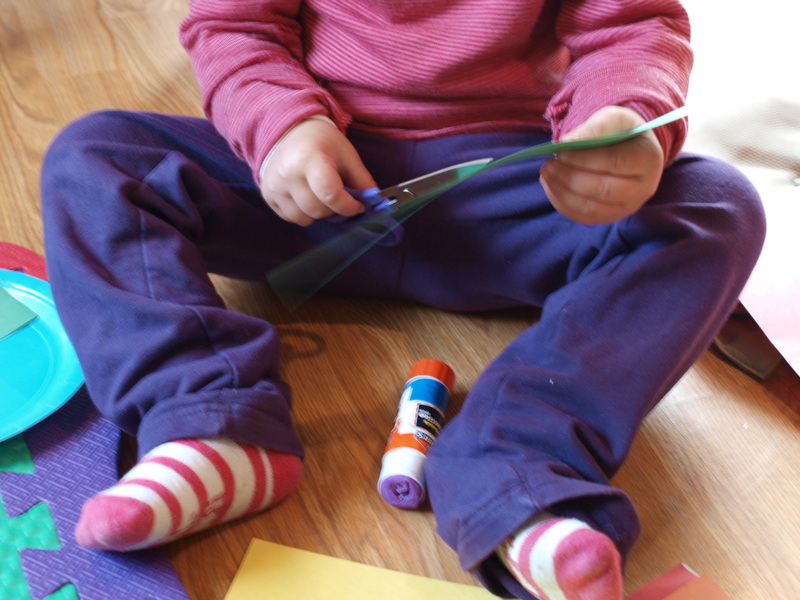 Jane was thoroughly disappointed, so instead of making her throw out her twiggy treasure, I let her take them inside the house and suggested we come up with a project for them after I put Sam to bed. My first thought was painting with them or on them, but nixed the idea after realizing it would involve another bath. Making a 3-D structure like our toothpick-gumdrop tripods also seemed like a good idea, but I was too tired to do all the intricate tying that would be involved in making a house or boat out of string and twigs. 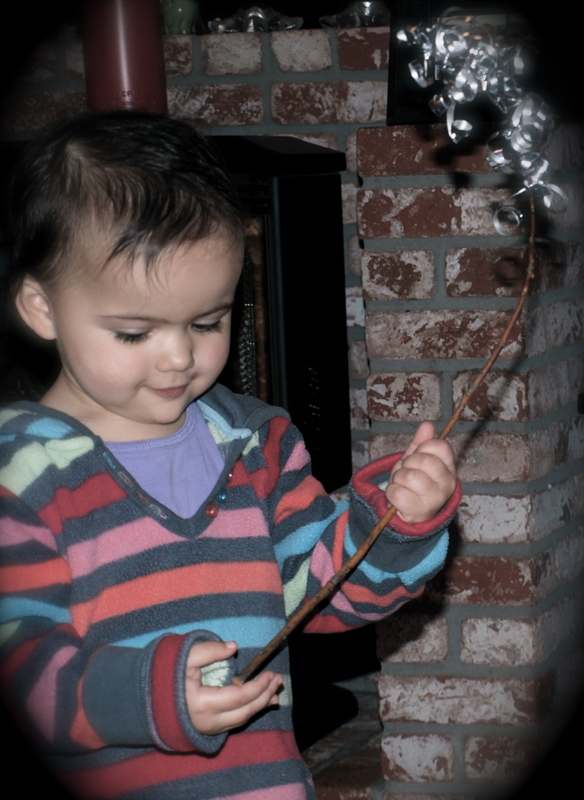 Luckily, I spotted some shiny silver ribbon on the counter and came up with the super fun idea of making a magic wand. 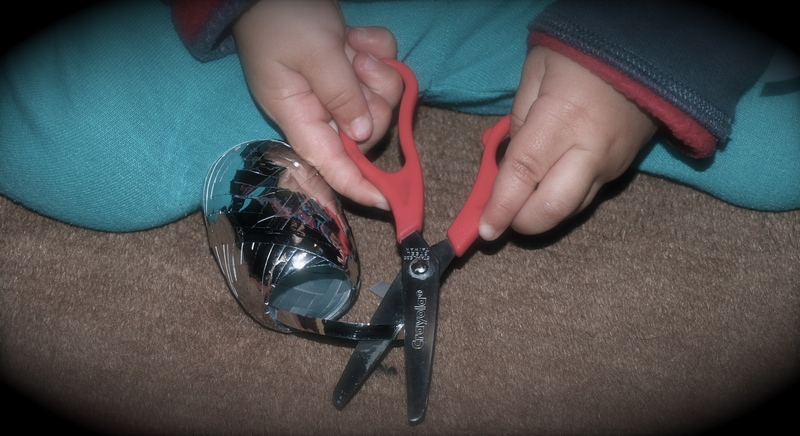 Have your toddler snip lengths of ribbon either with you holding the ribbon taut or on her own. 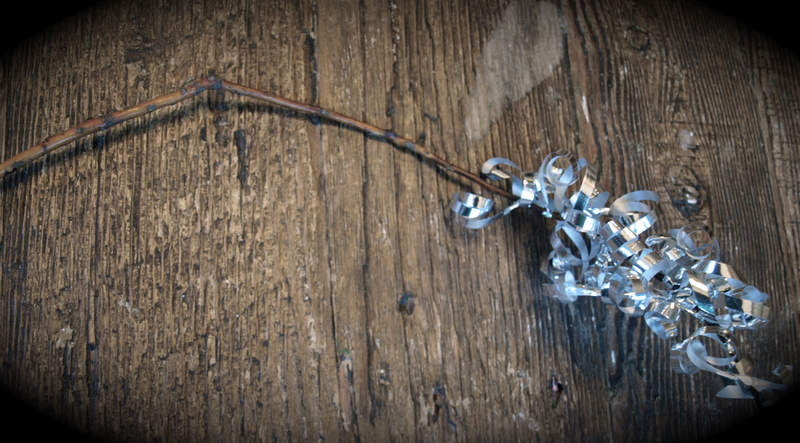 Tie the ribbon pieces to the top portion of the stick and curl each piece with a scissor blade. Sam woke up at the indecent hour of 5:00 a.m., so Jane and I needed something to do on this cold and dreary rainy morning until he woke up from his 7:00 a.m. nap. 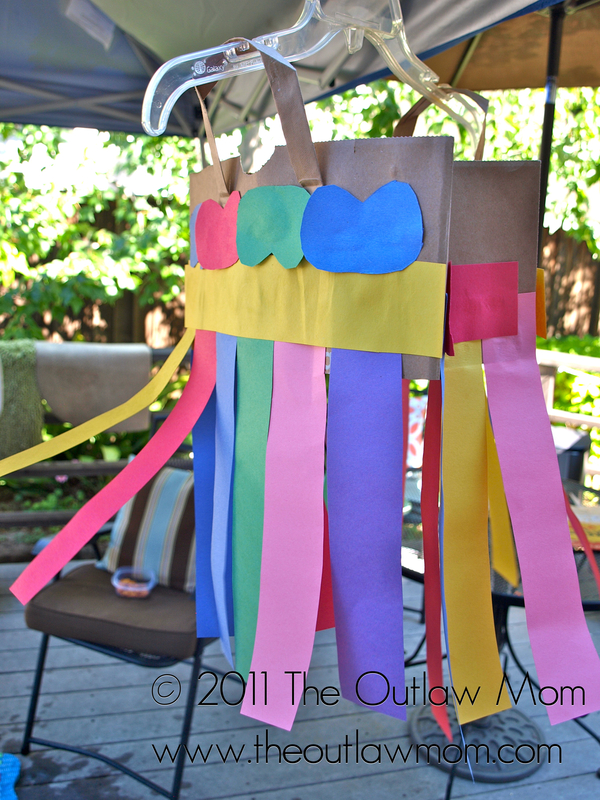 We couldn’t play outside, but The Crafty Crow saved the day with this great idea from the journey into unschooling. 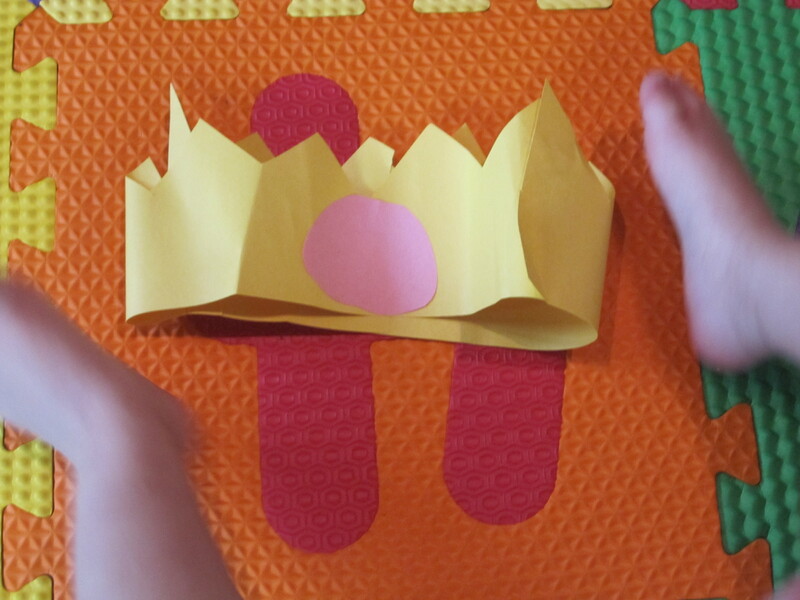 The construction paper lion looked the easiest and we set out to make one. 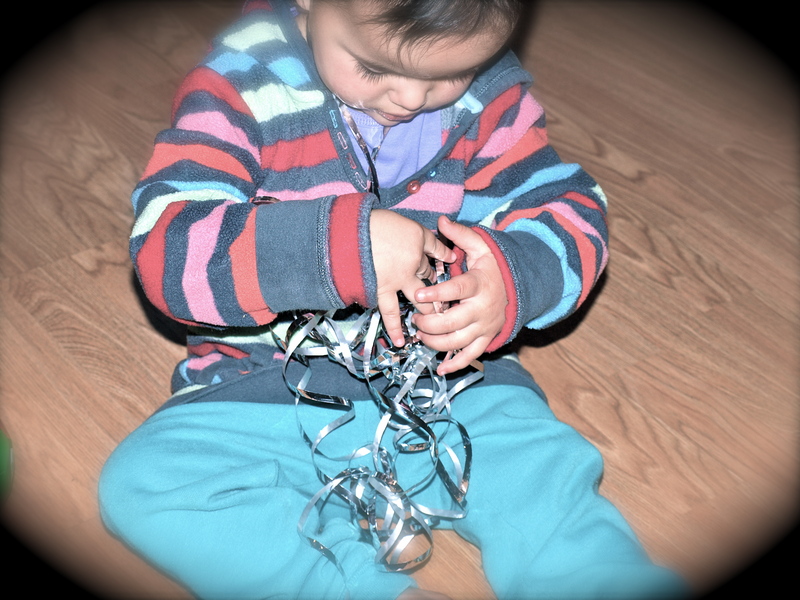 But as always, what we started out to do didn’t end up exactly as we planned! 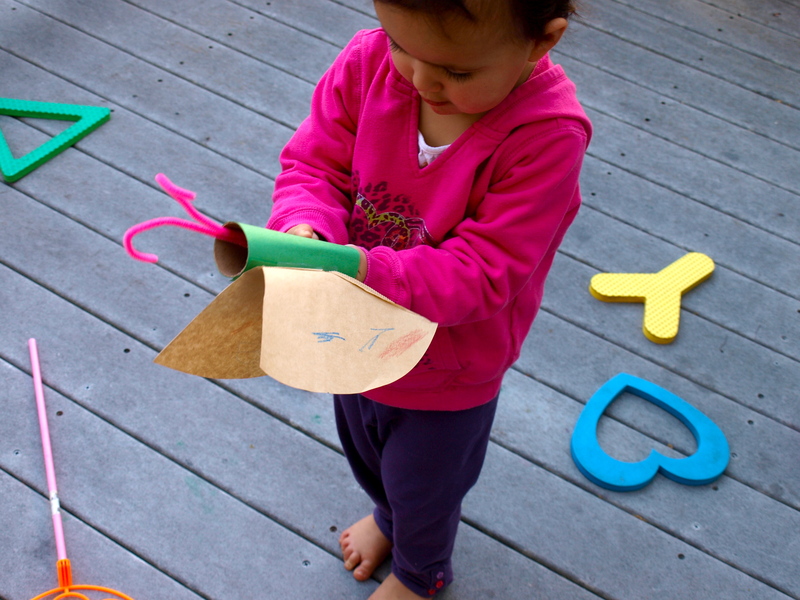 Here’s how we made our construction paper octopus with what I now know are six arms and two legs (not eight arms or eight legs). 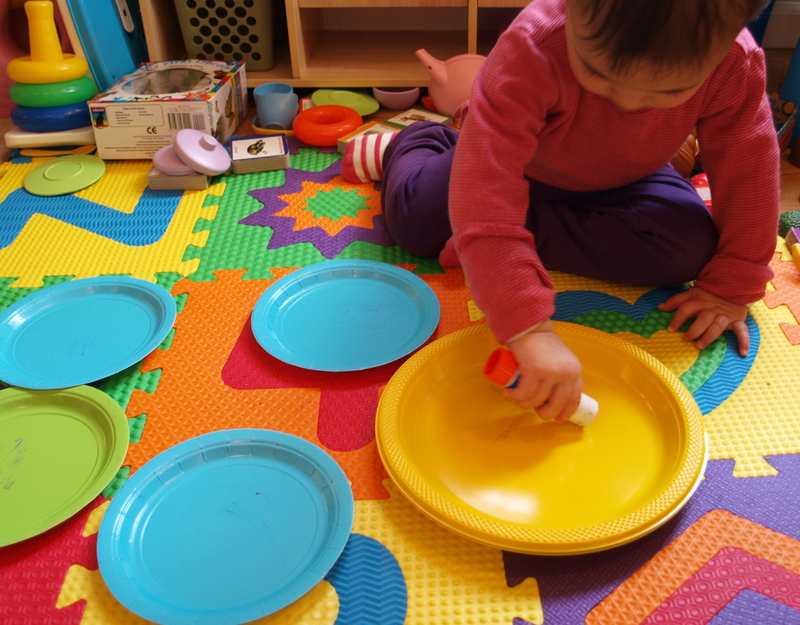 First, we grabbed leftover plates from Jane’s Special Agent Oso themed birthday party. 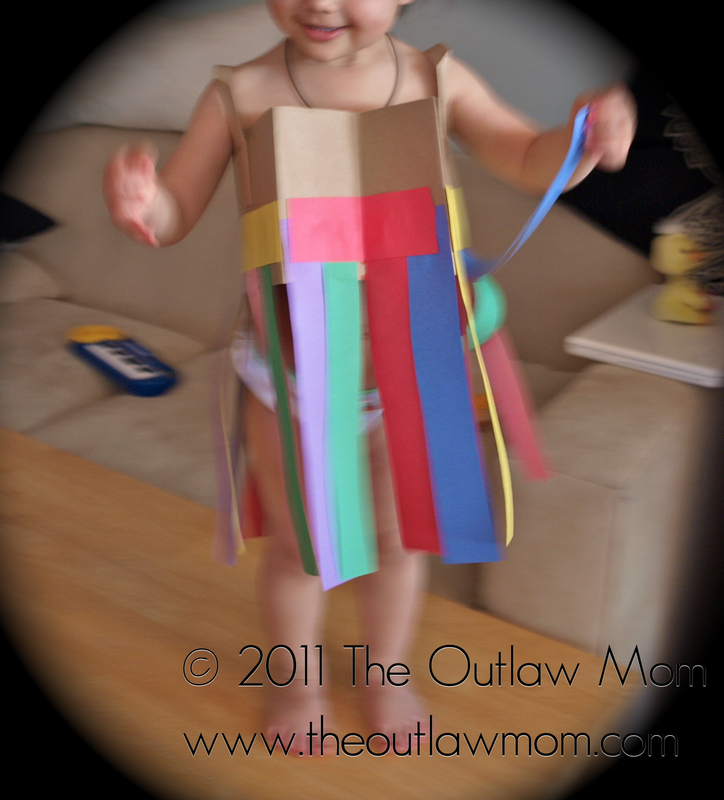 Then, we cut out strips from the construction paper to make the lion’s mane-turned-octopus arms and legs. 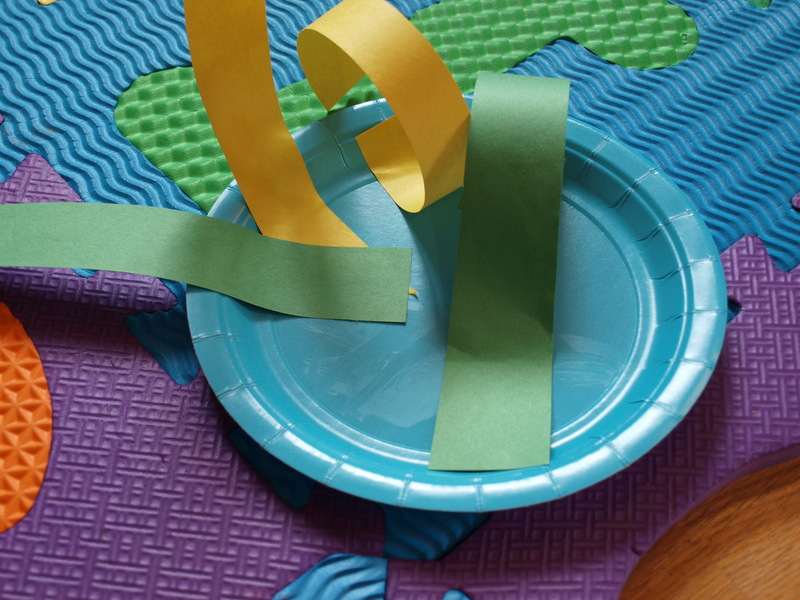 Next, I curled the paper strips using the scissors (just as you would with ribbon) and Jane glued the curled strips to the plate. 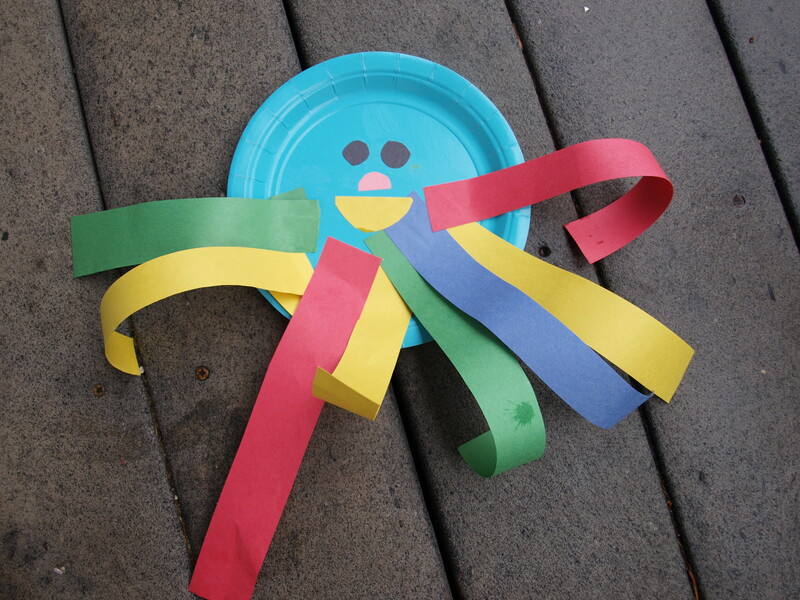 Finally, I cut out the eyes, nose and mouth from the construction paper scraps and Jane glued them onto the plate to make the octopus’s face. 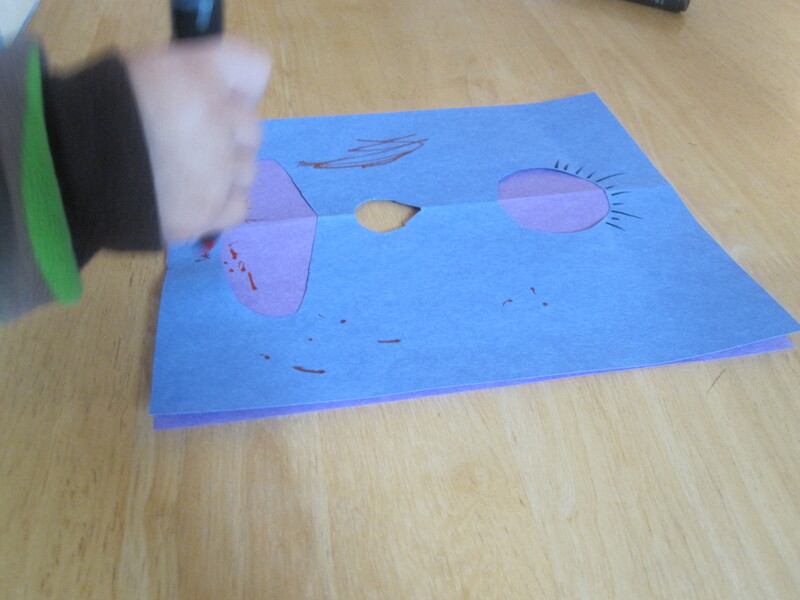 It turned out that the face on the “octopus” scared Jane and she begged me to get rid of it! But . 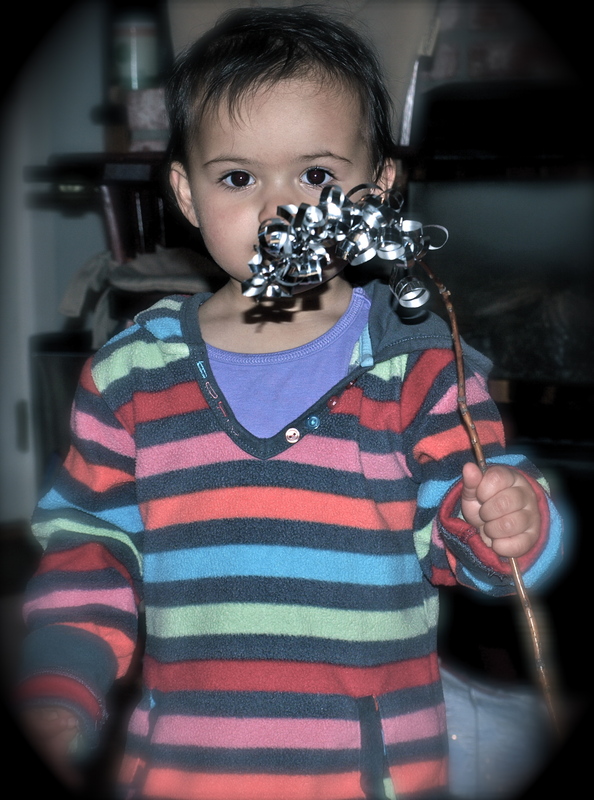 . . she wasn’t afraid to continue our project with markers – that’s my girl! 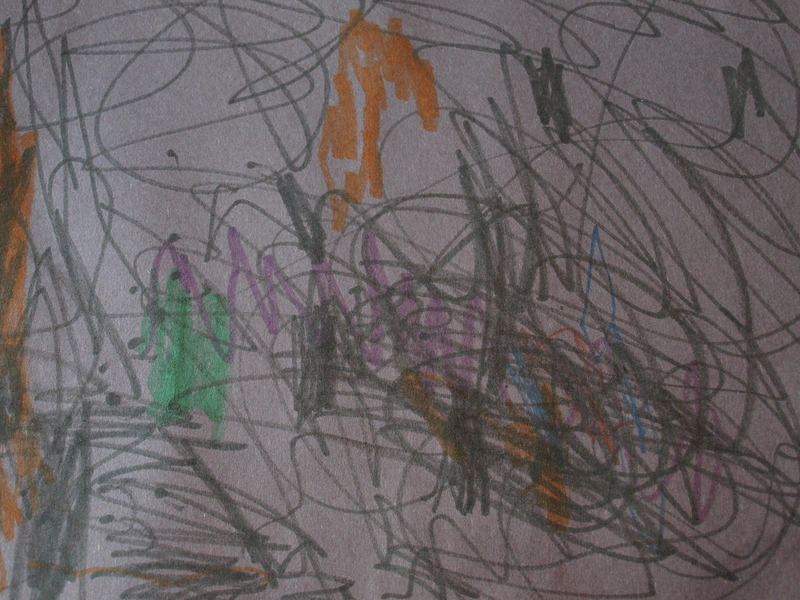 I think it evokes “deep sea,” don’t you? In the literally five minutes I had to put the finishing touches on my makeup, cook the kids breakfast, pack my own lunch and give the nanny instructions about Sam’s medicine, I actually managed to get in this super quick monster mask for Jane, who insisted I make it in between cooking her spattering sausages on the stovetop and putting my shoes on to run out the door to work. 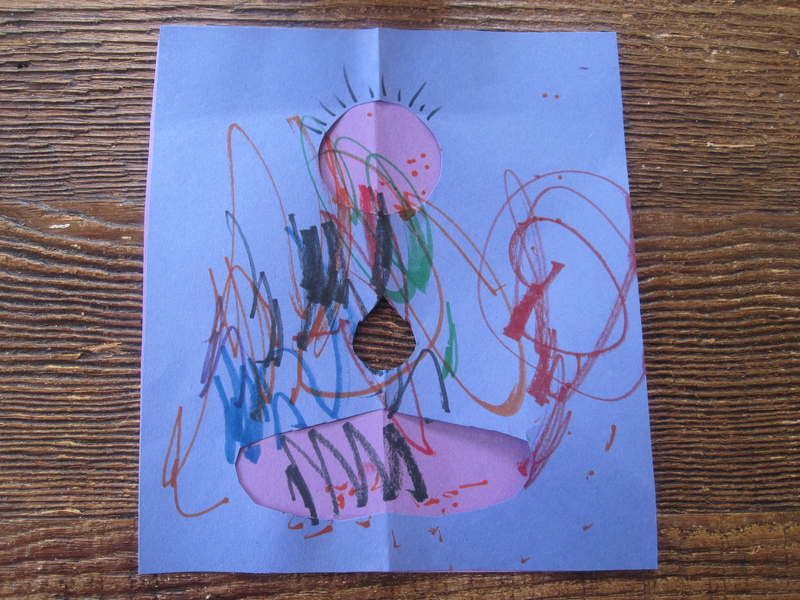 Even faster than our Two-Minute Marker Monster, I did this while simultaneously walking in between the kitchen to turn Jane’s sausages in the pan and the family room where I was trying to catch bits of baby breakfast that Sam was throwing around the room. 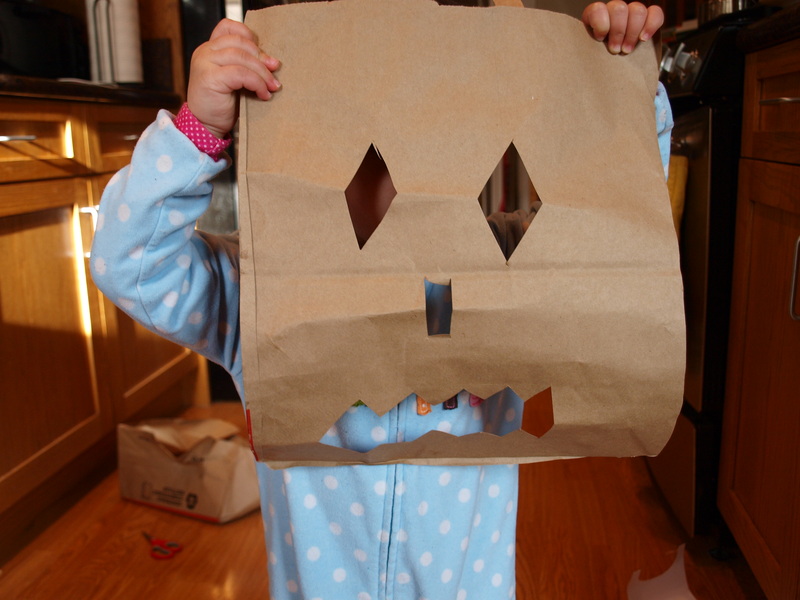 To make this jack o’ lantern monster mask: (1) Just cut out one side of a paper grocery bag, (2) then pinch the areas where you want to cut out the eyes, nose and mouth, (3) make your cutouts and you’re finished! If you have the time (unlike me! 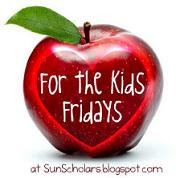 ), you can size it to your child’s face. 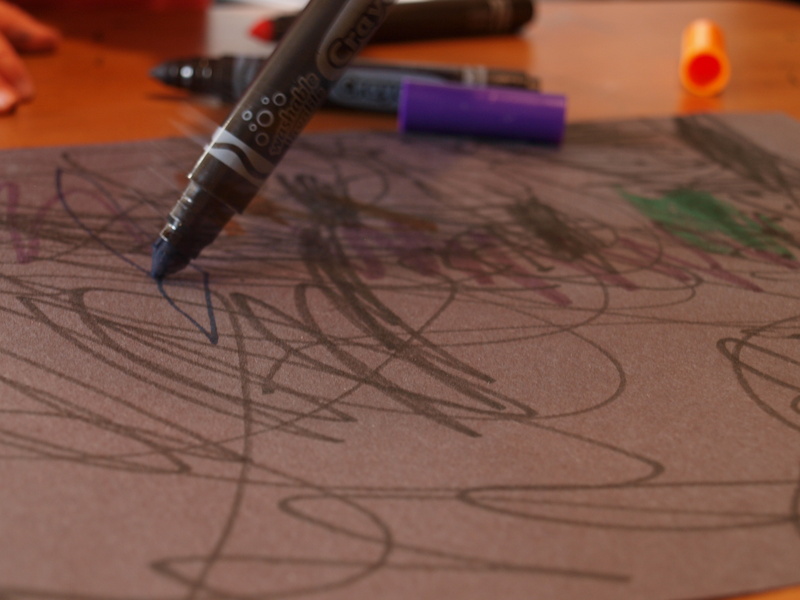 Your toddler can also decorate it with glitter, marker or crayon or whatever she sees fit. 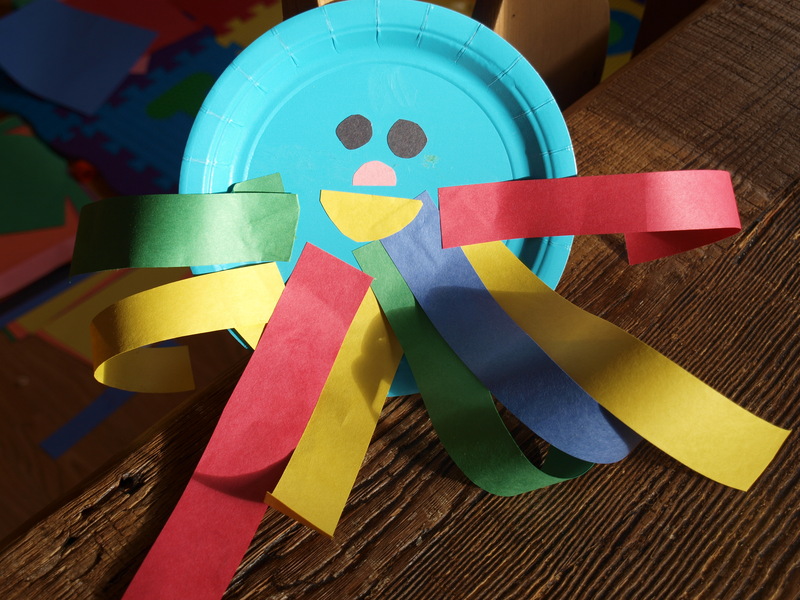 It’s nothing fancy, but with no time to spare and a toddler begging for something fun, it totally fits the bill. Now, with all the monsters in our house, we might just have to make this Monster Repellent Spray from Chica and Jo! 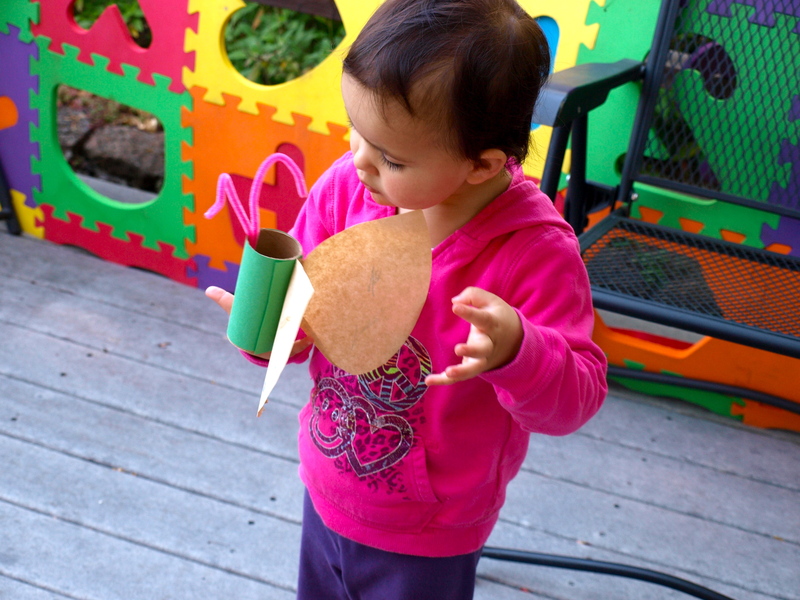 (Or, I could get Jane onto something a little less scary like these paper dolls from The Artful Parent). 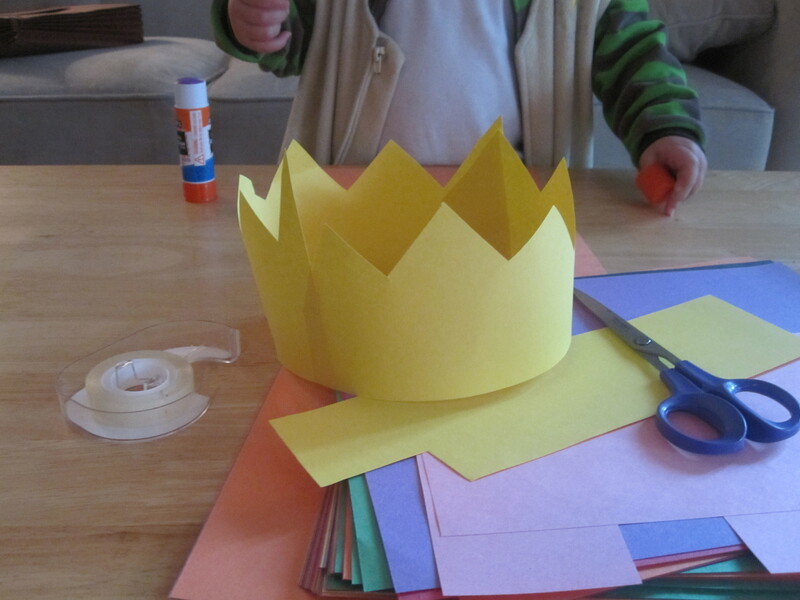 Minute One: Cut out two 2 to 3-inch thick rectangular strips from a yellow piece of construction paper, making random jagged cuts to form the top of the crown. 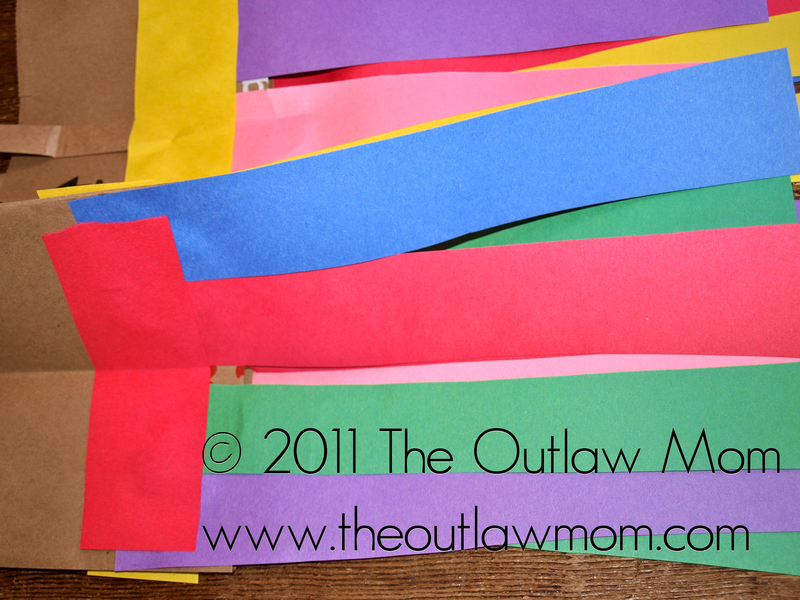 Have your toddler glue the ends or use double-sided tape to stick the paper strips together. 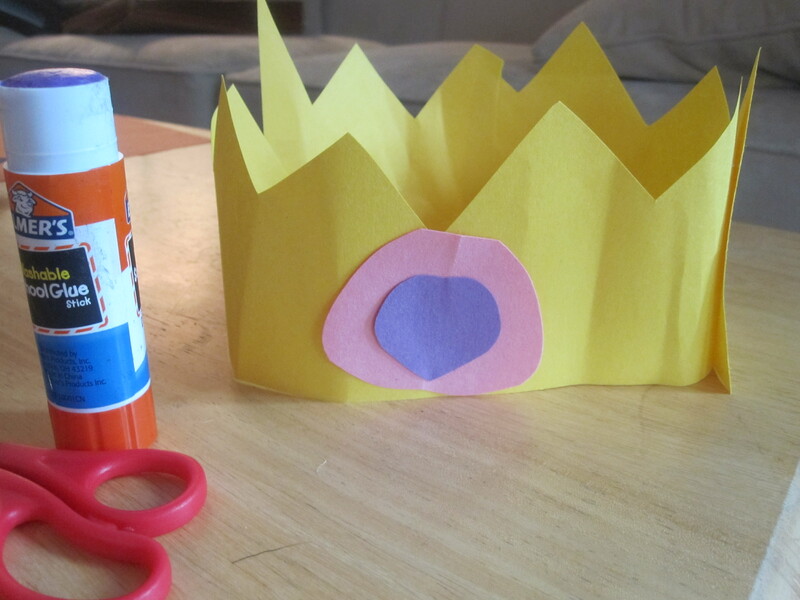 The Next 30 Seconds: Cut out different colored circles or other shapes to make the crown's jewels. 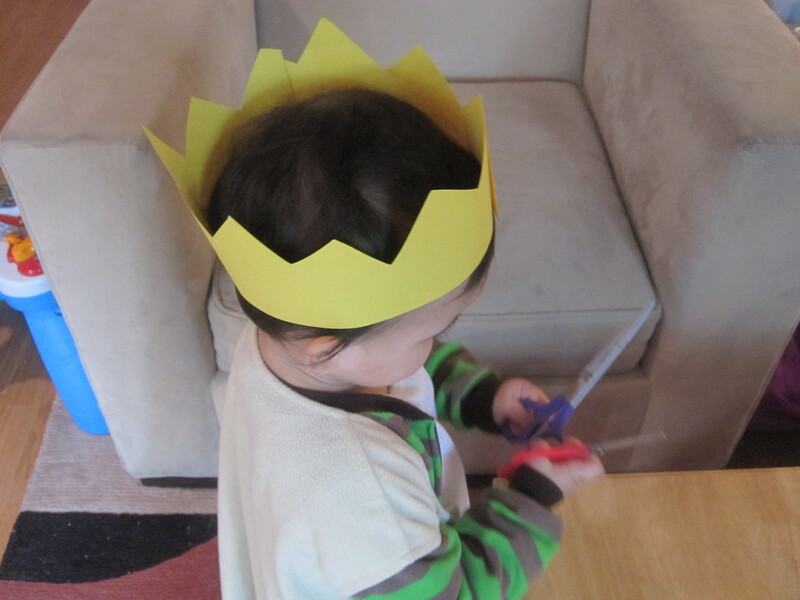 The Last 30 Seconds: Glue as many "jewels" and "gems" as you can to the crown before your toddler rips it out of your hands! 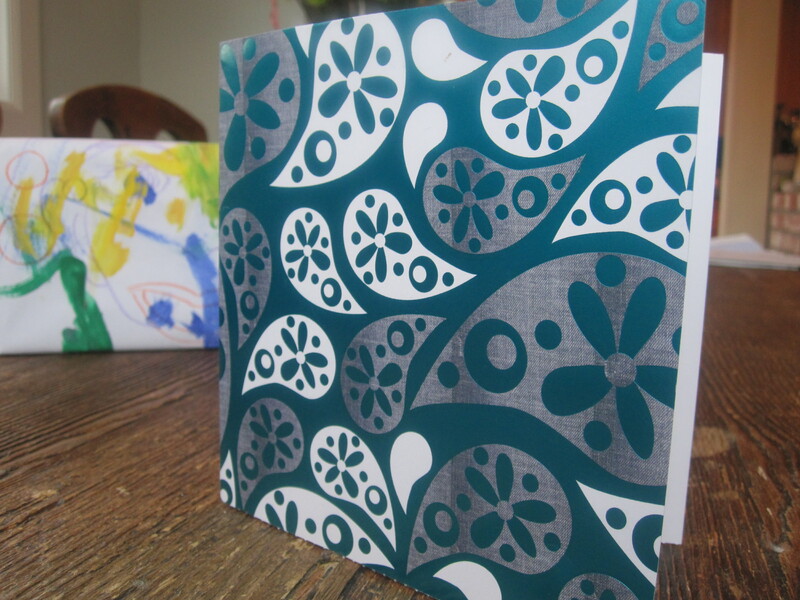 Here are the instructions for the card and cardholder we gave Hubby along with his specially gift-wrapped present. 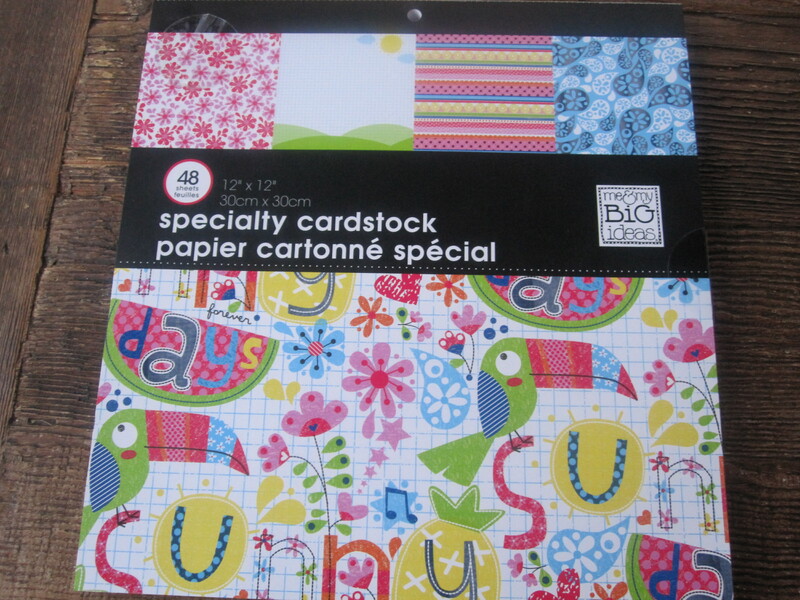 This specialty cardstock pad is from Michaels. 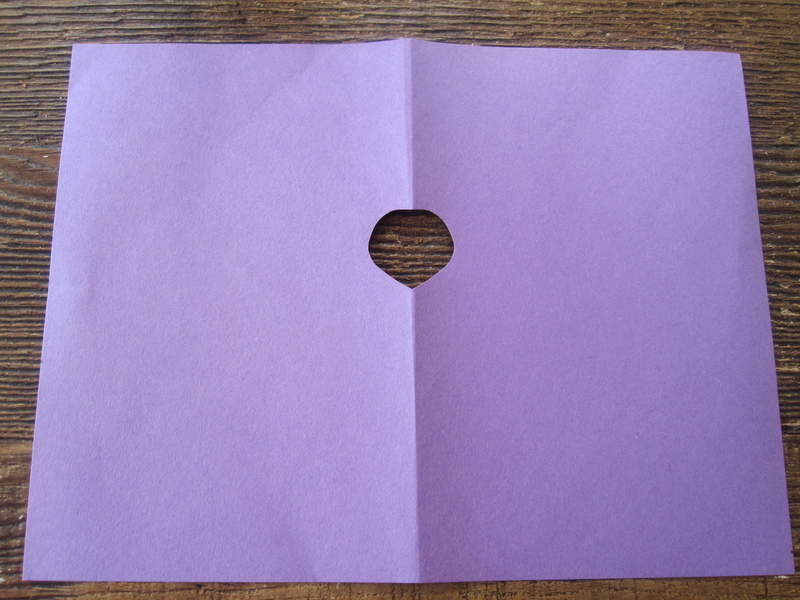 Cut out a square for your card. 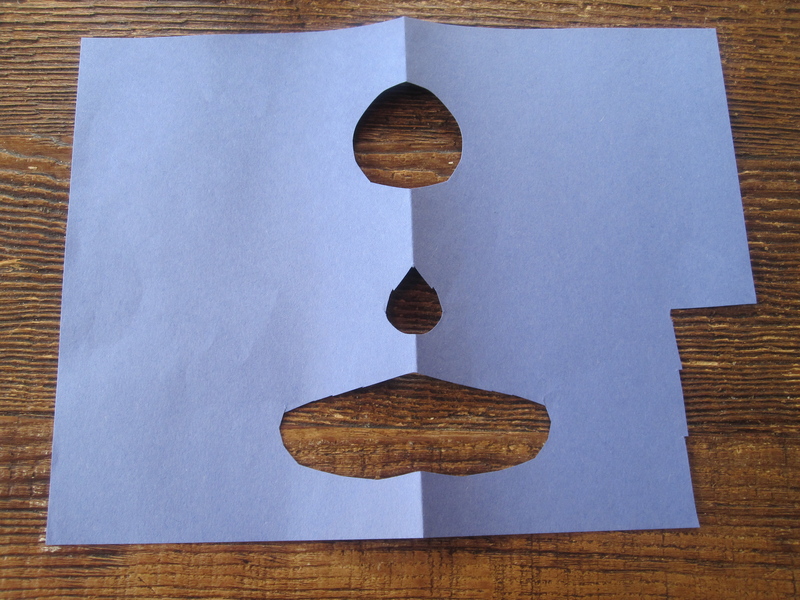 Fold the remaining rectangular piece in half, then unfold. 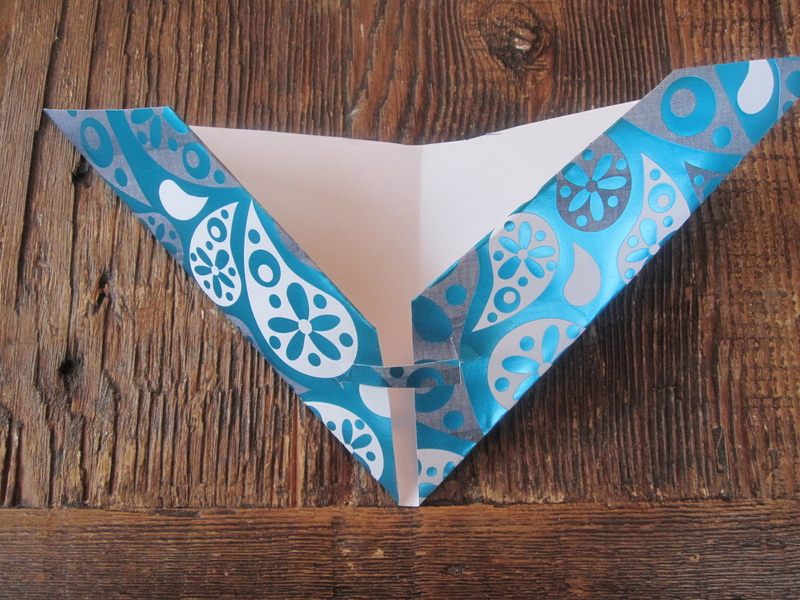 Fold in the bottom corners of the right side and the left side into a triangle. 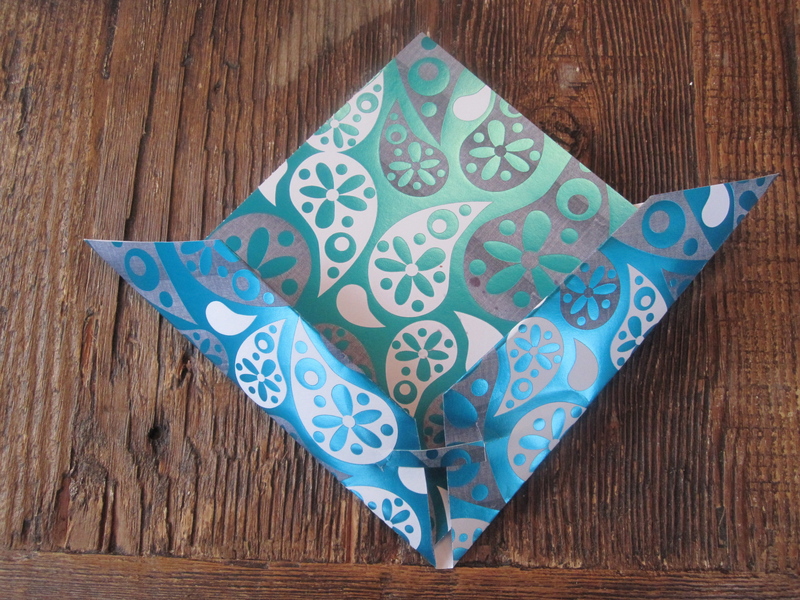 Open the triangles and then fold the corners a second time. 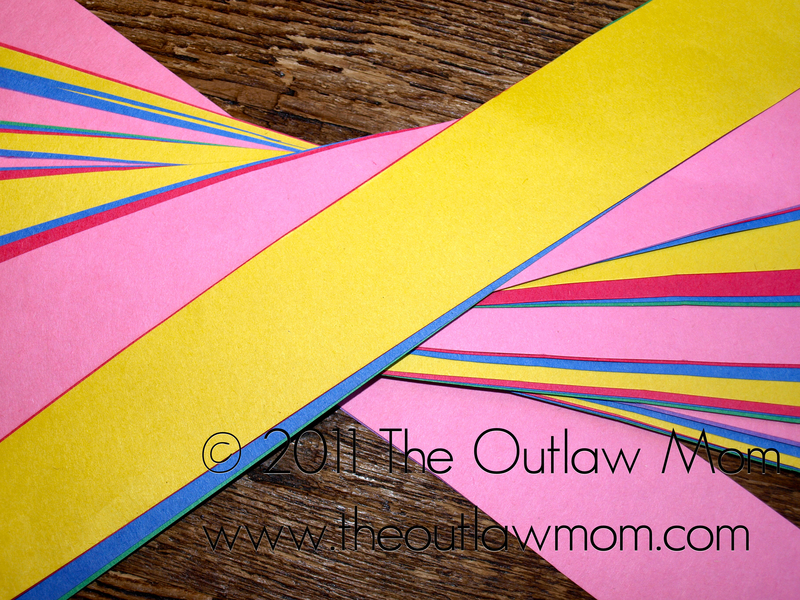 Then cut a sliver of paper from the inside corners folded in towards each other and set one aside. 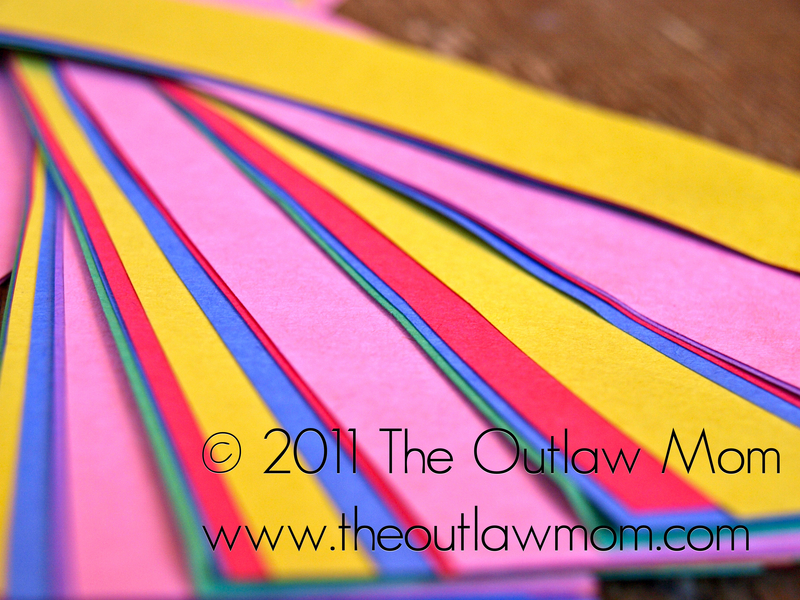 Cut a vertical slit into both sides (pinch the paper and then just snip once with a pair of scissors) and insert the saved sliver of paper into the slits horizontally. 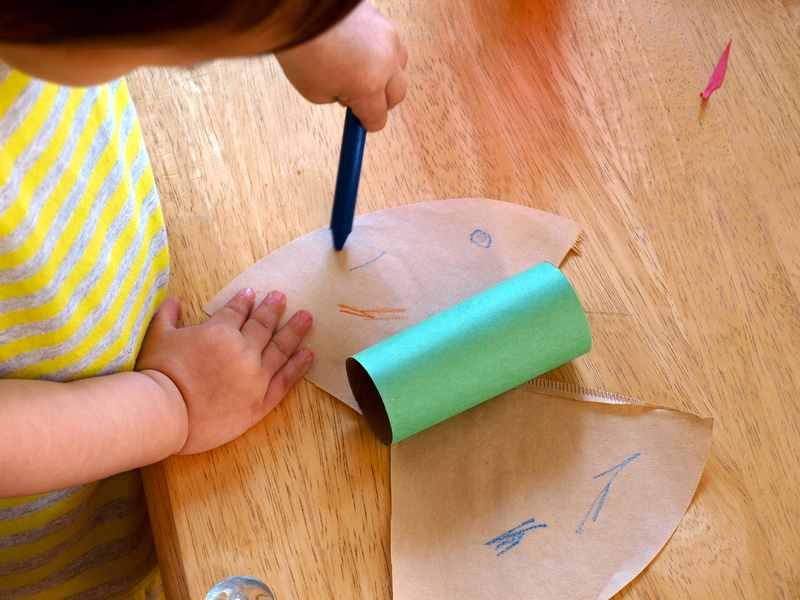 Use tape to secure the paper strip if needed. 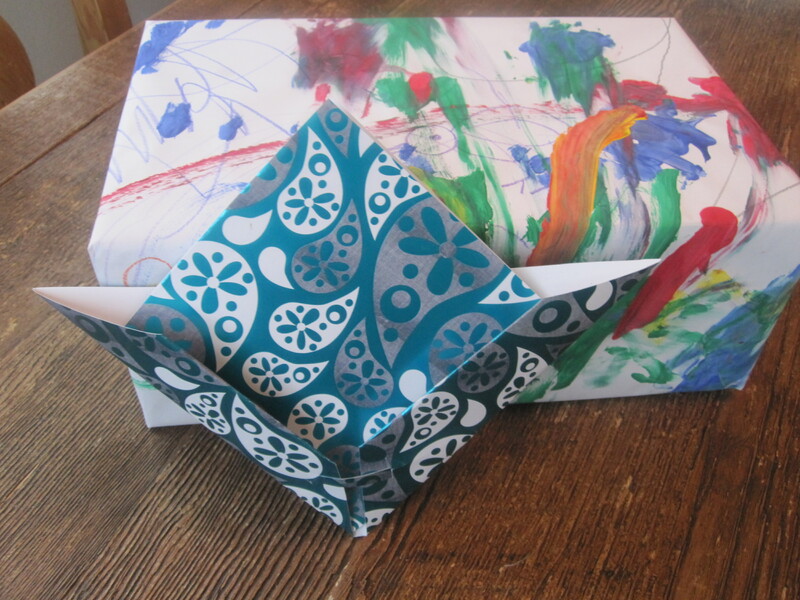 Step 4: After writing your message inside the card, insert the card into the cardholder and you’re finished!